You are currently browsing the archives for the Shariah Law category. When I wrote this post, I wrote it to highlight the fact that widely accepted Islamic documents teach principles that are totally contrary to the US Constitution. Let’s compare that with the First Amendment. The difference between human rights in Islam vs. the civil rights in the Constitution is dramatic. The Constitution, specifically the First Amendment, doesn’t put qualifiers on the exercise of free speech. 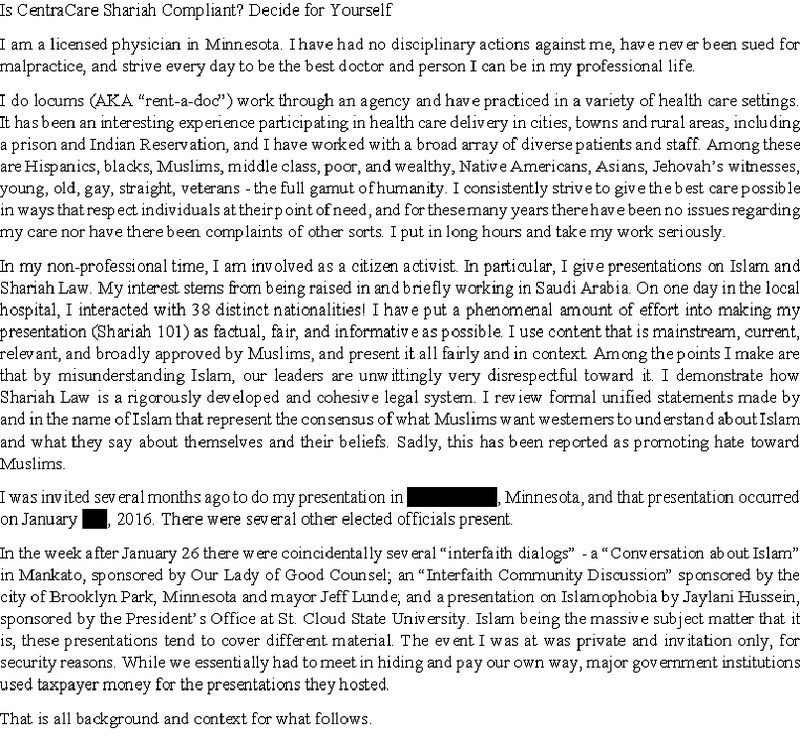 According to the Cairo Declaration of Human Rights in Islam, everyone has the “right to express his opinion freely” if it isn’t “contrary to the principles of Shari’ah.” That’s a pretty big qualifier. 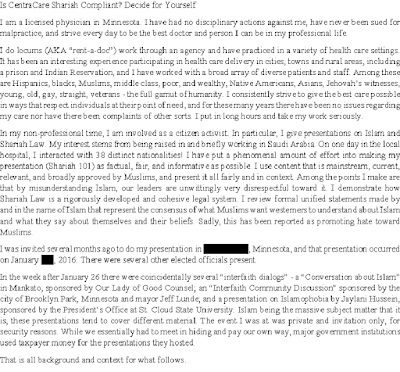 It’s apparent that being Shari’ah-compliant is important to St. Cloud’s Islamic leaders. 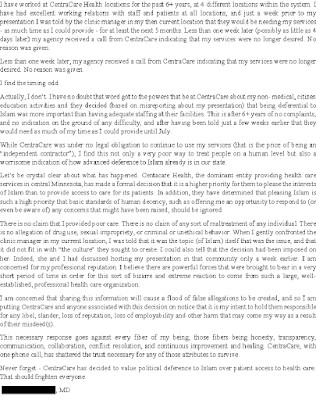 It’s apparent because Dr. Johnson was terminated less than 2 weeks after he signed a contract with CentraCare and after he was told that CentraCare advised him they’d need him to work “as much as possible for the next six months” and less than a week after Dr. Johnson had given his presentation. The chief point to take from this is that CentraCare put a higher priority on being politically correct than it’s putting on living according to the Constitution. 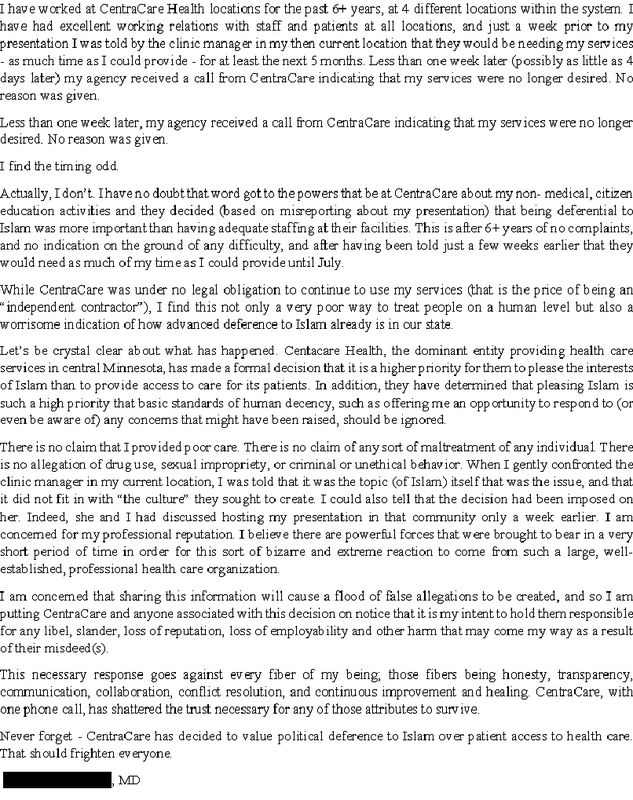 If businesses like CentraCare are willing to trash the First Amendment and become Shariah-compliant, then the First Amendment will have been seriously undermined. If you want to only be able to speak your mind when you aren’t contradicting Shariah, do nothing. If you think that the Constitution and the First Amendment are right, however, then it’s imperative that you join the fight against the Cairo Declaration of Human Rights in Islam.